Written by Mark K. Bauman. Originally published in Generations 2007-2008: Maryland and Israel. To order a print copy of the magazine, see details here. On August 23, 1950, Israeli Prime Minister David Ben-Gurion attended a luncheon in his honor in Jerusalem, where he exchanged remarks with Baltimore businessman and community leader Jacob Blaustein. This was no mere conversation: the Israeli cabinet was present and Ben-Gurion’s comments had President Chaim Weizmann’s prior approval. Developed over many months and during a series of meetings, the historic exchange attempted to establish a framework for Israel-diaspora relations, employable for the foreseeable future. During the conversation, Ben-Gurion and Blaustein praised the accomplishments of each other’s Jewish community, although Blaustein pointedly commented about some statements of Israeli officials that implied that all Jews should return to Israel from exile in the diaspora since life for Jews outside the Jewish homeland was tenuous and incomplete. These statements, said Blaustein, undercut the security and moral of American Jews. Both men then agreed that American Jews would lobby, donate to, and raise money for the new nation without meddling in Israeli policies and politics. Israel, for its part, recognized the allegiance of American Jews to the United States. It, too, would not meddle in the internal affairs of diaspora Jewry. Individuals who chose to make aliyah were needed and would be warmly welcomed, but those remaining in America would not be disparaged as “exiles.” Neither American nor Israeli Jews would speak in behalf of the other. The Blaustein–Ben-Gurion agreement defining the post-statehood relationship between Israel and American Jewry was perhaps Blaustein’s best-known achievement in an extraordinary career as a citizen-diplomat. The joint statement signed by the two men seems straightforward, but its back story involved a complex mixture of politics and history related not only to the founding of Israel, but to American Jewish communal identity, longstanding debates over Zionism, and the relationship between diaspora Jews and the Yishuv, the Jewish settler community of pre-state Israel. Jacob Blaustein was perhaps the most logical figure in American Jewry to navigate through the complicated past to reach such an accord. A wealthy oil tycoon and businessman, he had already won national and international recognition as a negotiator and diplomat on several fronts, from the establishment of the United Nations to reparations for Holocaust survivors to American and international energy policy. In addition to his reputation and skills as a diplomat, his leadership of the American Jewish Committee (AJComm) – a group with historically strong reservations about Zionism – paradoxically put him in the perfect position to sit down with Israel’s leader. The AJComm had been established in 1906 by wealthy and influential Jews largely of German descent. It did not broaden its membership until the presidency of Judge Joseph Proskeur (1943–1949). Although of East European origin, Jacob Blaustein’s stature and political connections opened his path into this elite group. He served as chair of the executive board during Proskeur’s presidency, president immediately after (1949–1954) and finally as an extremely active honorary president (1954–1970). Blaustein’s positions within the AJComm symbolized the expansion of the organization to include the rising and now acceptable upper class of East European origin. It also illustrated Baltimore leadership beyond the New York/Philadelphia nexus of power and the impact of Baltimore Jewry on national, international, and particularly America/Israeli affairs. As a transitional leader, Blaustein’s advocacy for the creation and recognition of the Jewish state emanated from the Zionism of his East European heritage and coincided with the gradual acceptance of Zionism by many AJComm leaders. His activities in behalf of Israel were extensive. During the 1940s, he lobbied Presidents Roosevelt and Truman as a key representative of the AJComm for the partition of Palestine through the United Nations and then for American recognition of the new state as well as for Israel’s admission into the U.N. Later, he promoted the 1950 Middle East arms control agreement between the United States, France, and Britain, and championed import-export loans and subsequent grants and arms sales from the U.S. to Israel, among other diplomatic efforts. “David Ben-Gurion and Jacob Blaustein Agree that American Jewry’s Prime Loyalty Is to the United States, August 23, 1950,” in The Jew in the American World: A Sourcebook, ed. Jacob R. Marcus (Detroit: Wayne State University Press, 1996), 489-494. The agreement was reported in the New York Times, August 24, 1950. For a full account of this and subsequent agreements, negotiations, difficulties, and the critical role of Blaustein as lobbyist/diplomat, see Zvi Ganin, An Uneasy Relationship: American Jewish Leadership and Israel, 1948-1957 (Syracuse: Syracuse University Press, 2005). Naomi W. Cohen, Not Free to Desist: The American Jewish Committee, 1906-1966 (Philadelphia: Jewish Publication Society, 1972). Proskauer, for example, gradually moved from advocacy for a U.N. trusteeship to support for the partition of Palestine, from non-Zionism to promotion of a Jewish state, because of British intransigence especially relating to Jewish refugee immigration to Palestine. See Louis Hacker and Mark D. Hirsch, Proskauer: His Life and Times (University: University of Alabama Press, 1978), 142-151. Melvin I. Urofsky indicates that Nathum Goldman brought the final change to Proskauer’s position on Jewish statehood for Israel. See Urofsky, We Are One: American Jewry and Israel (Garden City, N.Y.: Anchor Press/Doubleday, 1978), 133. Hacker and Hirsch (154-155) essentially give Proskauer credit for the Ben-Gurion/Blaustein agreement. In fact the exchange of statements largely replicated positions of former AJComm executive director Morris D. Waldman and other AJComm statements, although internal factionalism also marked the AJComm during World War II. In 1943 the AJComm had issued the Cos Cob Formula, a declaration in favor of a temporary international trusteeship over Palestine until a political solution could ultimately be worked. See Morris D. Waldman to Blaustein, 6 February 1949, Jacob R. Marcus Center of the American Jewish Archives, Cincinnati (hereafter AJA), MC 23/1/1; Cohen, Not Free to Desist, 250-56, 295-309. Cohen describes the political maneuvering between the AJComm, Zionist, and other organizations, the gradual shift of AJComm’s positions, and divisions within AJComm. She also explains the development of the AJComm position in regard to the Ben-Gurion/Blaustein agreement and problems of adherence (309-319). See also Marianne R. Sanua, Let Us Prove Strong: The American Jewish Committee, 1945-2006 (Waltham, Mass. : Brandeis University Press, 2006), 20-24, on the Cos Cob agreement, Proskaeur’s dissent from it, and gradual move to Zionism. 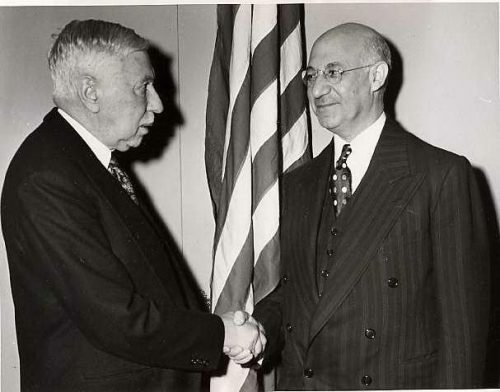 Blaustein informed President Harry Truman how essential American recognition of Israel was since Israel had been denied admission to the U. N. Truman assured Blaustein that the United States would recognized Israel immediately following Israel’s January elections. Blaustein to Morris D. Waldman, 3 January 1949, AJA, MC 23/1/1. “Jacob Blaustein,” American Jewish Committee Biographical Sketch (hereafter cited as Bio Sketch), original at AJA, copy in “Jacob Blaustein” Vertical File, Jewish Museum of Maryland (hereafter JMM). Johns Hopkins University in Baltimore houses 700 cubic feet of Blaustein’s papers, the largest assemblage of Blaustein materials. Sanua, Let Us Prove Strong, provides a brief biographical sketch of Blaustein, 30-31, and extensive coverage of his activities with the AJComm throughout.